Can Citi Return to Its Pre-Crisis Glory? 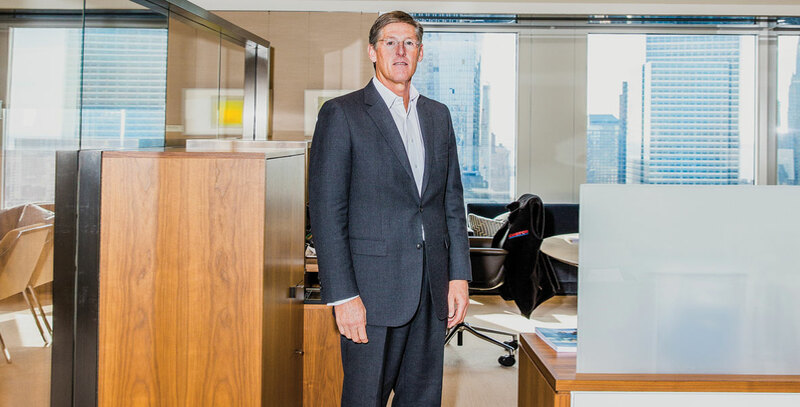 CEO Michael Corbat’s aggressive cost-cutting has put a simplified Citi on solid ground. But in returning the bank to its former greatness, he faces a much harder task. It might strain belief that Citigroup CEO Michael Corbat — at a burly 6'4" — chose to surrender the usual expansive corner office for a no-frills cubicle crammed with a conference table and bereft of doors or walls. But nobody doubts Corbat’s commitment to cutting costs. In his efforts to restore once-mighty Citi to precrisis health, Corbat has overseen the disposal of well over a half-trillion dollars of noncore and money-losing assets, lopped off fat in every business line, and slashed real estate spending — even for his own work space. Along the way, Citi retreated from the financial supermarket ambitions that nearly led to its collapse a decade ago and became instead more of a corporate investment bank than a retail lender, just as it was two generations ago. But companies rarely shrink themselves to greatness. And now Corbat, a former Harvard lineman, has to demonstrate he’s the quarterback Citi needs to grow — and finally reward its patient shareholders. To achieve that goal, Corbat and his team intend to take full advantage of Citi’s status as the most international of U.S. banks and the one most dependent on foreign revenues. With a larger global footprint than any other American lender, Citi is ramping up its multinational corporate banking while reducing less profitable retail operations abroad. Back home, where Citi relies on credit card revenues more than its rivals, it is seeking more clients, using products that proved successful overseas. And after falling far behind other major banks, Citi is aiming to deliver the highest payouts in the industry. But in trying to regain its precrisis eminence, Citi faces as many obstacles as opportunities. The banking world has become a much tougher place. Capital costs aren’t nearly as low, nor returns anywhere as high, as a decade ago. Despite talk of less regulation, enough safeguards will probably remain in place to trump any return to the freewheeling M&A ways of the past. And while Citi touts the comparative advantages of its unique business model, it faces fierce competition at home from deeper-pocketed banks like JPMorgan Chase & Co. and Bank of America and from powerful players in Asia and Latin America. New multinational corporations are mushrooming in emerging markets and may prefer their own homegrown banks to American ones. Still, last July at the company’s investor day — the first since 2008 — an upbeat Corbat proclaimed the lost decade over. Citi was turning the page to a new era of sustained profitability. Starting this year, he committed the bank to continuous rises in income and a whopping $60 billion in buybacks and dividends by 2020. Revenue is supposed to grow at four times the pace of costs. Corbat and his team are off to a decent start. Net income for the first three quarters of 2017 was $12 billion, up a respectable 7 percent over the same period last year. With the Federal Reserve Board’s approval, some $19 billion is being returned to shareholders by the end of this year. And Citi’s stock rose 27 percent last year — more than double the banking sector average. Citi’s ability to take on more risk is also improving. No major bank is better capitalized or has a higher percentage of cash reserves in the event of another crisis on the scale of 2008–9. “We have at least twice the capital we had back then,” says John Gerspach, 63, the chief financial officer. But alongside this new sense of security, there is the vision of an institution far less ambitious than it once was. The precrisis conglomerate aspired to be all things financial to all people: an insurer, an asset manager, a hedge fund. Citi was the leading U.S. bank by assets, having tripled in size in the decade leading up to 2007. And at its height, it also had the largest head count, at 357,000 people. Then the crisis exploded, leaving Citi more exposed than any other major bank. Gargantuan losses in loans and subprime securities forced it to turn to the government for the biggest bank bailout of all. To stay afloat, Citi heaved assets overboard as if it were the crew of a sinking ship. The bank tumbled to fourth place by assets — behind JPMorgan Chase, Bank of America, and Wells Fargo. It chopped head count by more than a third. And its share price fell more than 90 percent. Corbat has presided over the long, thankless task of ridding Citi of its unwanted assets. He was the London-based head of Citi’s Europe, Middle East, and Africa operations when he was named in 2012 to replace Vikram Pandit as Citigroup CEO. But it was his successful stint as head of Citi Holdings — the so-called bad bank created in 2009 to deal with some $800 billion in toxic and noncore assets — that earned Corbat the top job. By mid-2011, Citi had repaid its $45 billion bailout and returned $13 billion in profits to taxpayers. Citi Holdings shrank so much that the bank stopped reporting it as a separate entity this year. Throughout the long wind-down, Corbat worked smoothly with regulators. “He was helpful, knowledgeable, and professional in his dealings with us,” recalls Sheila Bair, former chair of the Federal Deposit Insurance Corp. Along the way, Corbat and his team nevertheless endured blistering criticism from shareholders for failing stress tests and not moving even more quickly to dump assets. Only last year, some analysts were suggesting Citi shareholders would be better served by breaking up the bank roughly into wholesale and retail entities. “The crisis forced people to decide whether to stay at Citi and help rehabilitate it or move on,” says James Forese, 54, chief executive of the Institutional Clients Group, as Citi calls its corporate and investment bank. Now that the rehabilitation is over, Corbat and his tightly knit management group have to deliver growth — and that includes deftly handling the challenges Citi faces abroad. A native of Bristol, Connecticut, Corbat attended Harvard, where he was enough of a standout at offensive guard to gain the attention of National Football League scouts. Instead, he became a bond salesman at Salomon Brothers before it was acquired by Citi. The bank, founded in 1812 by a coterie of New York merchants and maritime traders, expanded until becoming by the late 20th century the financial flagship of America both at home and abroad. Guided by Sanford (Sandy) Weill, Citigroup also included insurer Travelers Group, stock brokerage Smith Barney, and bulge-bracket investment bank Salomon, among other entities. Corbat’s entire career has been at Citi or firms it absorbed, in posts that ranged from derivatives and wealth management to corporate and retail banking at home and abroad. “Even as a young guy, Mike was ambitious, very prepared, and had a clear sense of direction,” says Tom Maheras, managing partner of New York–based hedge fund firm Tegean Capital Management and a former Citi executive, who first met Corbat when they both worked at Salomon. Today, Corbat presides over a globe-straddling giant with $1.2 trillion in risk-weighted assets and a physical presence in 98 countries. International operations account for about half of Citi’s revenues. In the cavernous lobby of Citi’s glass tower headquarters, receptionists dubbed “ambassadors” greet client delegations from several continents. Two decades ago Western banks rushed abroad, confident their brand names and home-proved cross-selling expertise would conquer emerging markets. But the financial crisis and its aftermath have led analysts and fund managers to take a more skeptical view of global expansion. In a landmark report this past September, UBS asserted that retail banks were destroying risk-adjusted value by expanding overseas. The report cited seven global lenders, Citi among them, who thought their strong domestic brands would translate into competitive gains abroad. Instead in many cases, these banks were unable to achieve the economies of scale or cross-selling proficiency of local banks. Nor is corporate banking immune to globalization doubts. Trade is still expanding, though at a reduced pace. And lately, emerging markets don’t seem as safe a growth bet. “I’m more comfortable with Citi growing in developed markets,” says Brian Kleinhanzl, a banking analyst at Keefe, Bruyette & Woods. For Forese that would mean squandering the benefits of a global footprint. “If we can’t differentiate what we do relative to another competitor in our segment, then we can’t hope to deliver superior returns,” he says. Citi executives concede that a corporation doing business only in the U.S. has little reason to choose their bank from among a dozen other lenders. But if a company based in Iowa is sourcing raw materials in Asia and selling goods all over the world, it’s likelier to turn to Citi for help on liquidity management and capital issues. Ditto for a U.S. multinational doing business in Japan that needs to hedge its yen exposure. By focusing on multinationals, Citi has shed smaller, domestic businesses as it slashed its corporate clients from 32,000 just five years ago to 14,000 today. And that number will come down further, says Forese. Yet his division’s share of income is rising. The corporate and investment bank accounted for two thirds of Citi’s $14.9 billion in net earnings in 2016 and climbed past 70 percent of the group’s net income last year. To meet demands from more upscale customers, Citi is beefing up its lucrative Treasury and Trade Solutions franchise, which provides cash management, trade, and securities services to companies and governments around the world. TTS already contributes a quarter of corporate and institutional client revenues. But clouds are drifting across those blue-chip skies. Like other banks, Citi has followed its corporate clients abroad. But the composition of multinationals is changing dramatically. A dozen years ago 90 percent of Fortune 500 companies were from developed countries. Today almost a third are headquartered in emerging markets and are generally growing faster than U.S.-based multinationals. And no surprise, these new corporate giants tend to favor the domestic banks that weaned them. This is especially true in China. Citi has only 47 branches there, mainly in the largest cities. Industrial and Commercial Bank of China (ICBC), the largest Chinese bank, blankets the country with more than 18,000 branches, which provide a huge reservoir of cheap funding. Prodded by the government, Chinese banks partner with Chinese internet giants to develop their digital banking platforms, which helps boost their cost-income ratios. The best Citi can hope for in China is a small piece of the corporate wallet and pray that Chinese banks don’t expand too quickly into other emerging markets. For now, Citi and other Western banks benefit from the fact that large Chinese corporations and state-owned enterprises are not yet being served by Chinese banks abroad. “But this will become more of a priority over time,” says Forese. The other great advantage enjoyed by the major U.S. banks, including Citi, is the dollar’s dominance as the currency of international commerce. But this funding edge is also eroding. “We know China has been talking about a greater currency role for the renminbi,” says Christopher Lee, portfolio manager of Fidelity Select Financial Services Portfolio, which includes holdings in Citigroup. Citi’s corporate and investment bank is performing far better than its retail bank, especially abroad. The same game plan to cut back on client numbers while focusing on higher-income segments hasn’t yet proved itself in Citi’s retail operations. Along with a smaller footprint, net earnings at the retail bank fell by 20 percent in 2016 compared with 2015. Over the past dozen years, Citi has reduced the number of countries in which it does retail banking from 50 to 19. And Citi is curtailing retail outlets in some of the remaining countries — even in fast-growing Asia. Over the next year, for example, Citi intends to close some 90 branches in South Korea and concentrate the remainder in centers like Seoul and Busan. The glaring exception to Citi’s retail setbacks abroad is Mexico — by far its most profitable international operation. But ironically, that’s because Citi kept the popular local brand, Banamex, after purchasing the bank in 2001 for $12.5 billion. Citibanamex, currently Mexico’s second-largest bank, contributed nearly 10 percent to Citi’s total revenues in 2016 and figures prominently in the parent’s overall growth strategy. By 2020, Citi will invest $1 billion in its Mexico operations, mainly to expand its ATM and mobile banking networks. But Mexico faces political uncertainties from both sides of the border. Investors are increasingly concerned that the Trump administration will scuttle the North American Free Trade Agreement and impose taxes on Mexican imports that might reduce trade and depress the local economy. And Mexico’s presidential election in 2018 could bring to power a left-wing populist, Andrés Manuel López Obrador. At home, Citi is betting on credit cards to boost its retail earnings. Cards already account for about 26 percent of total group revenues — well above the 10 percent to 15 percent levels at Bank of America and JPMorgan Chase. With its proprietary cards, the bank tries to lure customers through promotions, such as cash-back rewards and zero percent introductory interest rates. More promising, though, is co-branding. An exclusive deal with retail giant Costco Wholesale Corp. last year added to a co-branded card portfolio that also includes American Airlines Group, the Home Depot, and Best Buy Co. Co-branding brings in large numbers of clients at a low investment, but revenues must be shared with the bank’s partner. “It’s all about getting the right mix of proprietary and co-brands,” says Stephen Bird, 50, chief executive of Global Consumer Banking, as Citi calls its retail bank. Citi is further ahead of its rivals in cutting back its branch network, part of a worldwide brick-and-mortar demolition underway as digitalization takes hold. Over the past four years, Citi has shuttered 30 percent of its branches and reduced its real estate footprint by a quarter. Between 2015 and 2025, automation in retail banking will shrink Citi’s overall head count by 30 percent, according to the bank’s estimates. “We are light on bricks and high on clicks,” says Bird, flashing a smartphone with a Citi app that displays all his financial information. That still leaves the bank wondering what to do with its nearly 700 remaining U.S. branches. Again, Citi is looking to its experience in Asia. Branches in Hong Kong and Singapore have been turned into clubby meeting places for Citigold members to consult their relationship managers over wine and caviar tastings. For a glimpse of the future American branch model, there is the midtown Manhattan Citigold Center. It evokes an airline business lounge, with out-of-town travelers arriving with bags in tow. In the Citigold suite upstairs, coffee and newspapers are free. But the real purpose of the center is cross-selling. Local Citigold members sit in front of flat-screen panels, comparing their savings and investment returns to the average customer with the same financial and age profile. They can then consult their relationship managers on funding college tuition, health care plans, and retirement accounts. “Banks are discovering that the real battle ahead is providing these types of services to existing clients,” says Lee, the Fidelity fund manager. Investors understandably are more focused on the prosaic present — and specifically on Citi’s capital management. No major U.S. bank came out of the crisis with larger losses or heavier regulatory burdens. One eighth of Citi’s 213,000 employees devote themselves full-time to ensuring the bank meets its risk, compliance, and legal regulatory obligations. Citi’s $45.5 billion in deferred tax assets — almost triple Bank of America’s total — reflect the extent of its losses during the crisis. In theory, DTAs could be used to shield part of Citi’s future cash flow from taxes. But Citi must comply with regulations that require the bank to hold dollar-for-dollar capital against the portion of the DTAs above a certain threshold — currently at $28 billion. That’s a considerable drag on Citi’s valuation and part of the reason its return on tangible equity at the end of 2016 was 9 percent compared to JPMorgan Chase’s 13 percent. “We would be having much easier conversations with our investors if our ROE wasn’t depressed by $28 billion of capital on which we earn nothing, zero, nada,” says CFO Gerspach. But it does create a further incentive to return to investors any capital not being used to run the bank. The $19 billion payout this year is equivalent to 127 percent of 2016 net income. And the $60 billion earmarked for return by 2020 is roughly the same as consensus estimates for total projected earnings for 2017 through 2019. “One thing we have seen with Corbat is that he has been an effective allocator of capital and a very shareholder-friendly leader,” says McKinney, the Allianz fund manager. Corbat insists capital management will continue to be his lodestar. The only money spent on acquisitions will be for those that spur organic growth, he says. He also sounds confident there will be enough capital left over for the digital technology investments that will help lure more high-income corporate and retail clients over the next five years. Should these plans come together, he says, Citi will have finally delivered on its promises to long-patient shareholders. And if that happens, will he surrender his cubicle for the usual luxurious executive suite? “Never — though you should never say never,” says Corbat, who believes the less ostentatious setting encourages colleagues to drop by. But even if he changes his mind, shareholders won’t mind the added expense. Photographs by David Williams; Photo 1: Michael Corbat, CEO of Citigroup; Photo 2: James Foresee, chief executive of the Institutional Clients Group; Photo 3: Stephen Bird, chief executive of Global Consumer Banking.